Today started off not so great, with a container of moldy Greek yogurt (not even past its best before date! ), but ended on high, due to this little email. Rewind back to the moldy yogurt discovery (which I did not photograph). 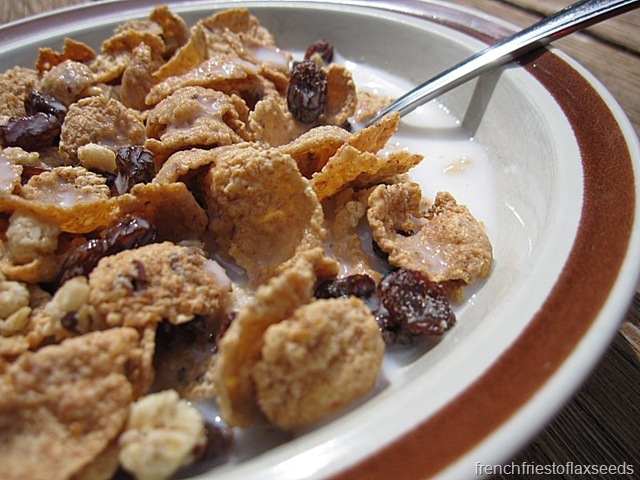 I had my heart set on some yogurty goodness, but had to go to plan B – cereal. 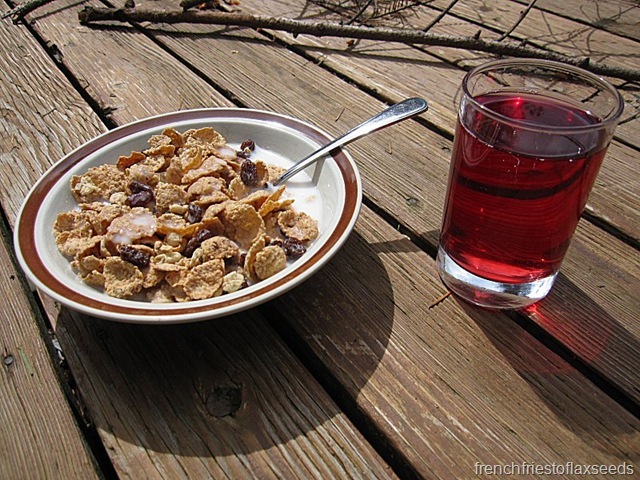 I guess I didn’t have to go to cereal, but when I can’t have what I want, I get lazy. 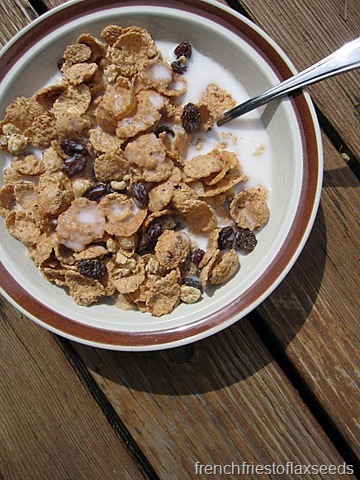 That’s where a nice bowl of Nature’s Path Pumpkin Raisin Crunch topped with almond milk comes in handy. 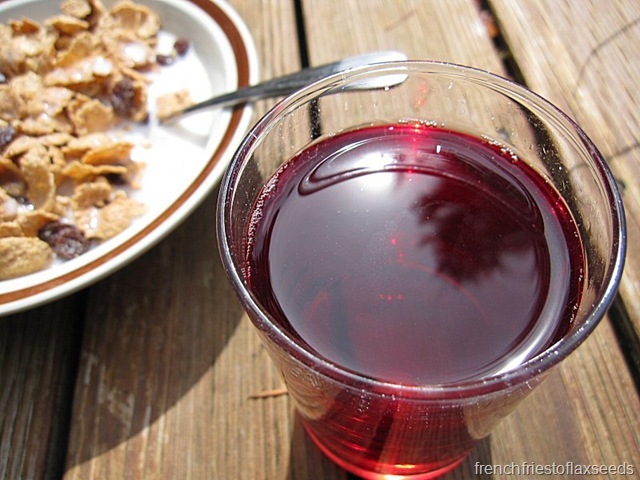 With a cheery glass of cranberry juice. Notice the branch lying on the deck from the storm yesterday, and the fact that it’s bright and sunny out. Looks can be deceiving. After enjoying my non-moldy breakfast, I checked out the flyer for Choices Market, and lo and behold – Greek yogurt was on sale. Perfect timing! I got in my car, and made the trip to stock up. By the time I got home, the sunshine had been replaced with torrential downpour, only to be replaced again with sunshine. Then hail. Then rain. And then some more sun. It’s hard to keep up. 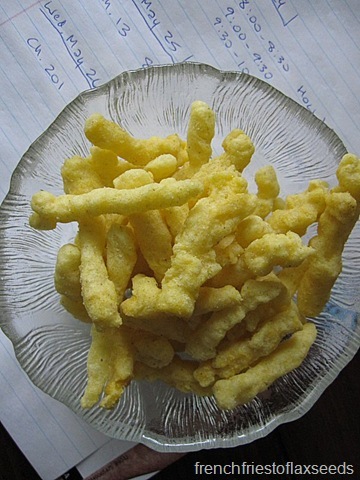 I had a lunch appetizer of Barbara’s Bakery Jalapeno Cheese Puffs, while I waiting for my oven to do its thing. What was in the oven, you ask? 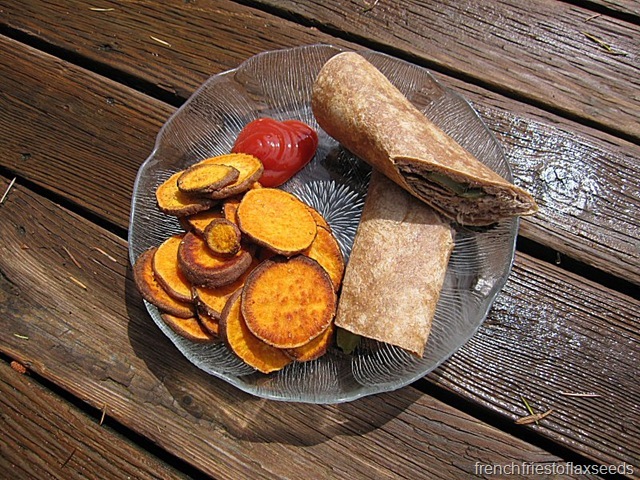 A little sweet potato action. 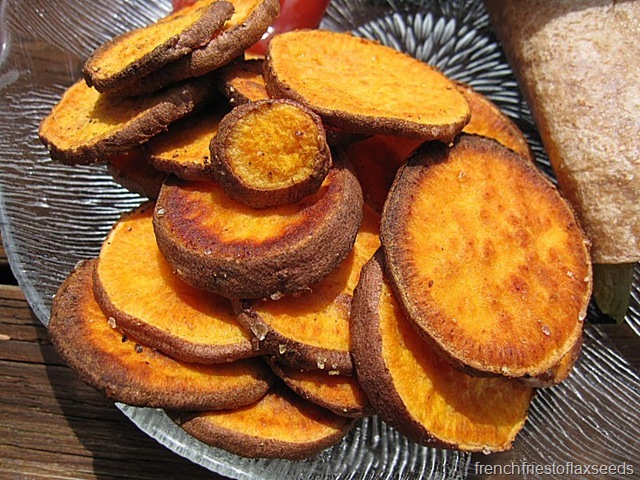 Specifically, sweet potato rounds, roasting away in coconut oil, sea salt, and cracked black pepper. 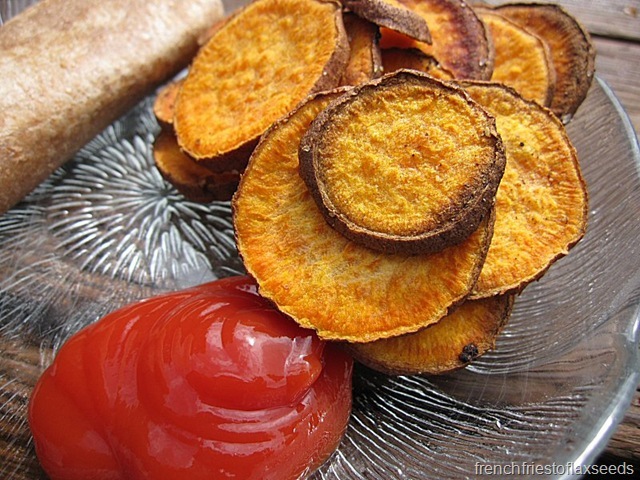 Ketchup on the side for dipping, of course. 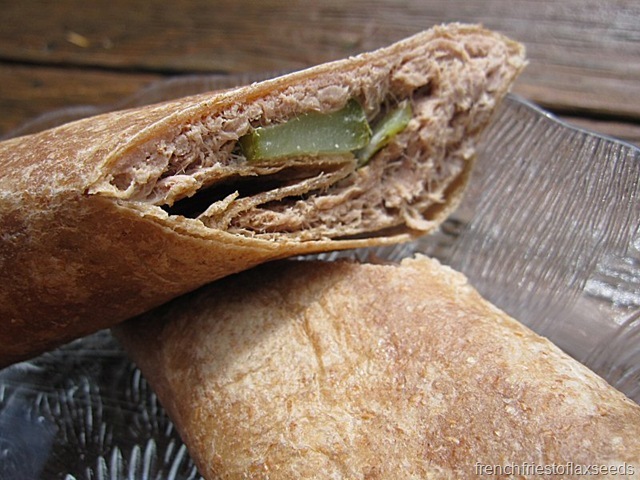 With a tuna wrap – whole wheat tortilla, tuna, mayo, dill pickle. It doesn’t look all that pretty, but it tastes good. The sun came back out between rain showers just so I could get in some food photography. Notice the now wet deck in the background. I had planned out a great BBQ dinner for the family, but once I received my oh so important email, I was able to convince my parents that we should go out for dinner. Actually, mom thought we should wait until Friday, until I reminded her that I was working. So off to dinner we went to the Cactus Club. No pictures, but I had the Halibut Soft Tacos – seared cajun halibut, chipotle aioli, shredded green cabbage, salsa fresca, guacamole. It was the perfect light celebration dinner. Why I don’t make my own fish tacos is beyond me – they really are quite tasty. After dinner, my mom and I went for a walk down at Rocky Point, since the rain was still holding off. It was a bit chilly, but a nice evening. We even saw some wee little baby Mallard ducks. They wouldn’t swim close enough for me to get a good photo though. Back at the house, we enjoyed some CSI, and a little dessert. I bet you thought I was having another bowl of strawberry rhubarb crumble, didn’t you? I had ice cream instead. 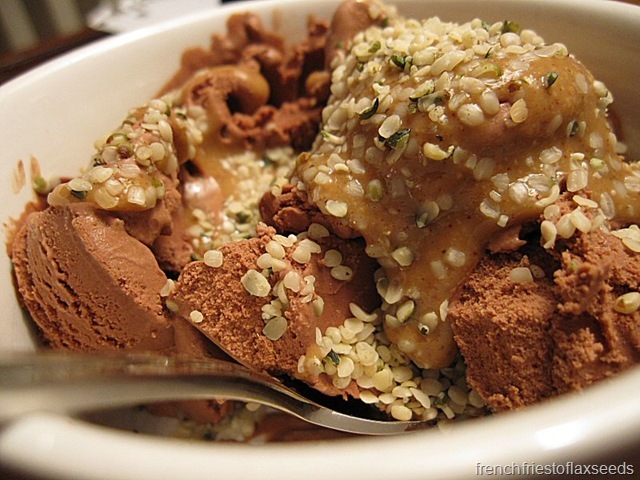 Coconut Bliss Chocolate Hazelnut Fudge ice cream to be exact, with a drizzle of hazelnut butter and sprinkle of hemp seeds for good measure. 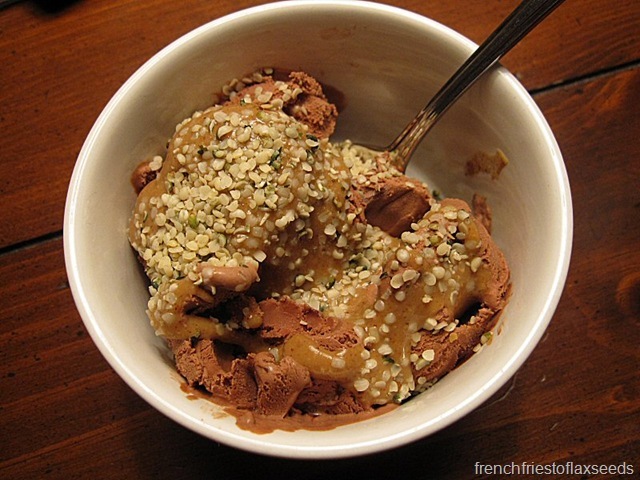 Oh yeah, check out that h-nut butter. Love it. Now my friends, I must go to bed. I have a 9 hour work day tomorrow (gross, I know) that starts at 10 am. For me, that’s early. Off to get some shut eye. Night! Congratulations! Your hard work really paid off! WAY TO GO! CONGRATULATIONS LOVE seriously its such a rewarding feeling, and i bet a great sense of everything fallling into place. What a great program to get accepted into too. UBC is notorious for their nutrition studies. seriously amazing girl! 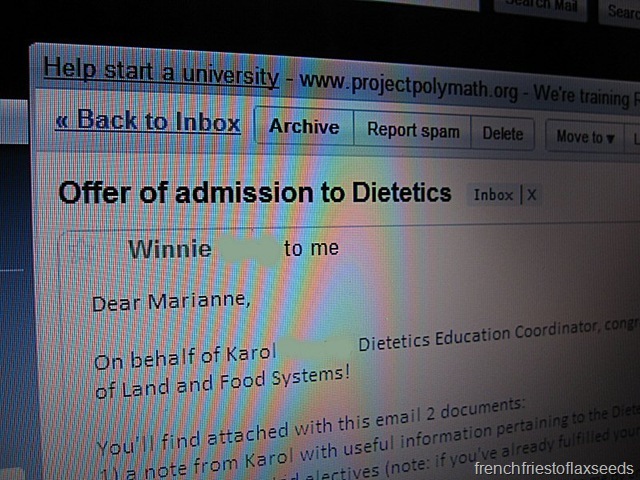 Congrats Marianne, I am so happy for you! I know how awesome and relieving that feels. BOTH of my Liberte yogurts from the Wellness fair went moldy – both with only opening it and taking out a scoop the day before! I may have to send Liberte an email. BC has sure seen some crazy weather this month. Holy smokes! The weather is crazy over in my part of BC too. It’s ridiculous. Today started out warmish and sunny, then rained liked crazy for a few hours, and then it became sunny and hot again. 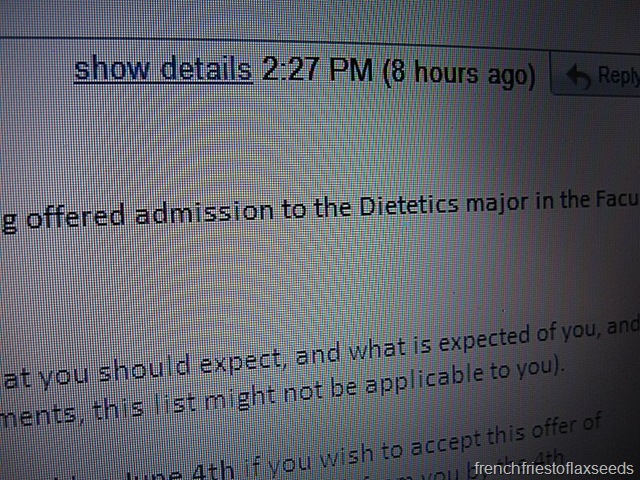 Congrats on getting into the dietetics program! Was your moldy yogurt from the Wellness show? I had to dump out both of the ones I bought. I suspect between them transporting them to and from their business to the show and then me transporting around the show and home, they weren’t kept constantly refrigerated or chilled enough. Pretty disappointing but can’t be too upset over $2.